Today, when you order "Art of Stealing Watches by Magic Underground - Book", you'll instantly be emailed a Penguin Magic gift certificate. You can spend it on anything you like at Penguin, just like cash. Just complete your order as normal, and within seconds you'll get an email with your gift certificate. You can achieve no greater reaction from a spectator as you can after you steal their watch. Though the watch steal is technically not a magic trick; it is very magical to the spectators. It seems absolutely impossible form sone to take off a person's watch without their knowledge. And in their minds, if you can take their watch, you can take anything! 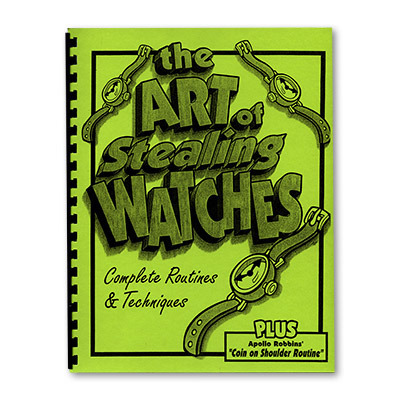 The watch steal is becoming more popular among working magicians as they are seeing its audience appeal. This book breaks the wrist watch steal down to its basic components, making it easier to learn. While learning the psychology behind the trick, why it works, and the best ways to perform it. If you are looking for audience reaction, this effect is it. Included bonus Appollo Robbins' "Coin on Shoulder Routine"